Bring a friend or meet new friends during an action-packed day. You’ll snorkel around a sunken plane and shipwreck, and identify marine life such as colorful tropical fish, rays, and sea turtles. One of the largest aqua parks in the Bahamas lets you bounce on huge in-water trampolines, rock and roll on floating icebergs, and test your balance on a log roll. 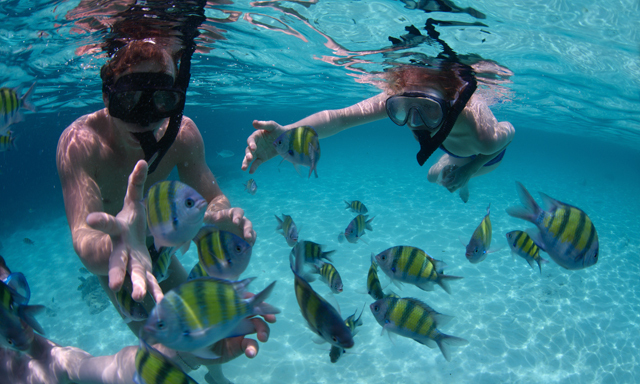 •Snorkeling: Swim around a sunken plane and shipwreck in view of marine life such as colorful tropical fish. •Aqua Park: Bounce on huge in-water trampolines, rock and roll on floating icebergs, and test your balance on a log roll.